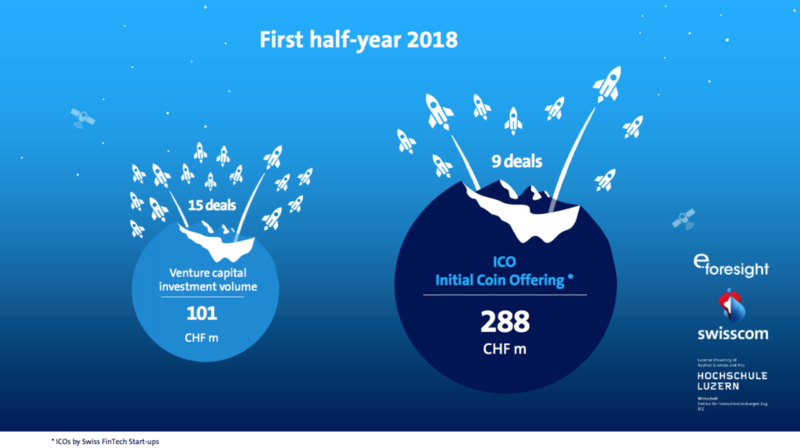 Swiss fintech startups raised a total of CHF 288 million through nine initial coin offerings (ICOs) in the first half of 2018, surpassing venture capital (VC) investments, according to a new report by e-foresight, the IFZ and Swisscom. The rise of ICOs is real and considerable in Switzerland with the total amount raised by ICOs already surpassing the whole year 2017 with CHF 283 million and seven ICOs. The nine ICOs in the first half of 2018 were Swissborg Invest AG, Tend Technologies AG, AidCoin, Proxeus, Envion AG, Traxia Stiftung, TokenPay Swiss AG, Odin Wealthmanagement AG, and Trade.io. The trend towards the alternative financing method will continue this year, according to the report, but affairs such as the investigation of Envion, showcase that the market is still premature and highly risky. The Swiss Financial Market Supervisory Authority (FINMA) announced last month the launch of enforcement proceedings against Envion over a possible infringement of financial market law in relation to its ICO. FINMA replaced the company’s board with a law firm working for the regulator. 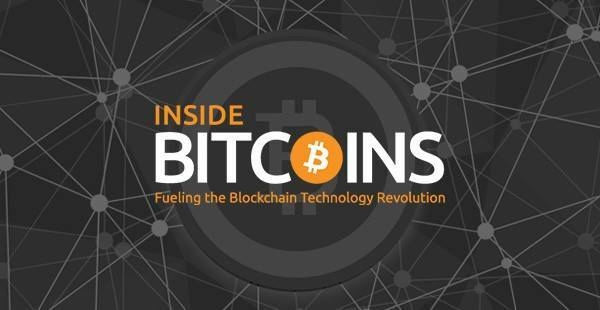 Nevertheless, startups are increasingly turning to ICOs to raise funding. Earlier this month, digital encryption startup Securosys unveiled plans for an unconventional ICO that combines the new fundraising style with elements of securities law. Securosys will be looking to raise about US$16 million through the ICO. It has already approved 25% of its shares for the token conversion as conditional capital. ICO participants will receive a token; 100 tokens translate into one Securosys share. The Zurich-based fintech startup has been profitable for two years and won a huge client in 2015, one year only after its founding: SIX interbank clearing. Besides ICOs, VC investment is on the rise too this year. In the first half of 2018, the report states that Swiss fintech startups raised a total volume of CHF 101 million through 15 VC deals. 2018 is set to surpass 2017’s VC volume of CHF 151 million and 48 deals. According to the report, VC deals are growing larger in size on average from CHF 61 million in 2016 to CHF 151 million in 2017. 67% of overall volume of VC funding (CHF 67.2 million) in the first half of 2018 went to the crypto area of business, followed by payments (CHF 27.1 million), investing and asset management (CHF 4.6 million), and crowdfunding (CHF 1.4 million). Switzerland is currently home to about 270 fintech startups, according to Swisscom and e-foresight’ monthly Swiss Fintech Startup Map. The most crowded segment is investing and asset management with 69 startups, crypto with 61 startups, and crowdfunding with 48 startups. 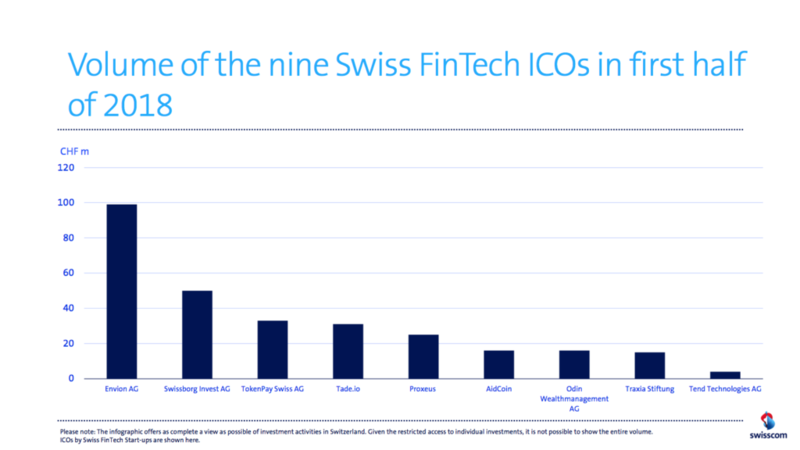 The post Swiss Fintech Startups Increasingly Turn to ICOs appeared first on Fintech Schweiz Digital Finance News – FintechNewsCH.